Occasionally people in get in touch with me through FB and something just clicks and we have to try to create something together. In this case Carey (Contessa) and I just share a love of elaborate, victorian era costumes. Due to life and with me being sick for so long we had to delay our shoot for the longest time but it all worked toward the good because when we did finally get together we did basically two shoots in. The first half was for the Dark Beauty “Secrets” photo competition which I’ll blog about in a separate post. The second half was all about Carey and her amazing dresses. We had such a good time working together. It’s always fun to find other people who are “into” what they are doing and are willing to make the time and effort to push their artistic ideas forward. As a burlesque dancer, Carey has a real stage presence and made these photos incredibly easy to create. 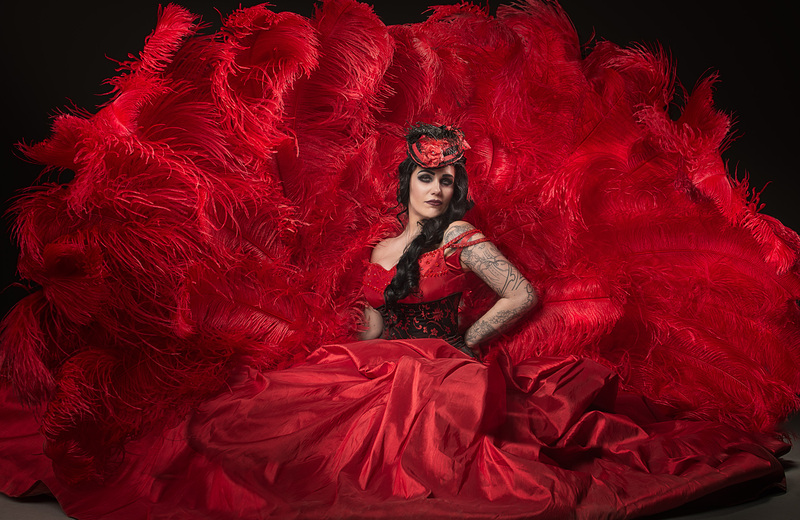 Add to that this amazing red dress she had made for her in China along with two, huge red ostrich feather fans and you have something that is hard NOT to take a good photo of.